This is the seventh part of the Quiet Book How To Series. You can check out my posts below to make my previous pages. From now on we will be making two pages, a front and back. The front is part 2 of the Doll Face Page. The back page is the Purse Page. Print out and cut out the mirror templates part 1 and 2. Pin part 1 onto the 2 sheets of purple and cut out. Pin part 2 onto the grey sheet and cut out. Pin the two purple part 1's on top of each other and sew all around. Pin part 2 on top of the sandwiched part 1 and sew all round. Fold part two a little less then half and pin to grey felt and cut out. Place on top of the pink sheet where you want the mirror to be. Sew all around the bottom leaving the top open to create a pocket. Sew a little piece of velcro to the right center "petal" of the mirror. Place the mirror on top of the pocket and sew the left center "petal" onto the sheet. Sew the other piece of the velcro next to the pocket where it would match the velcro on the mirror. 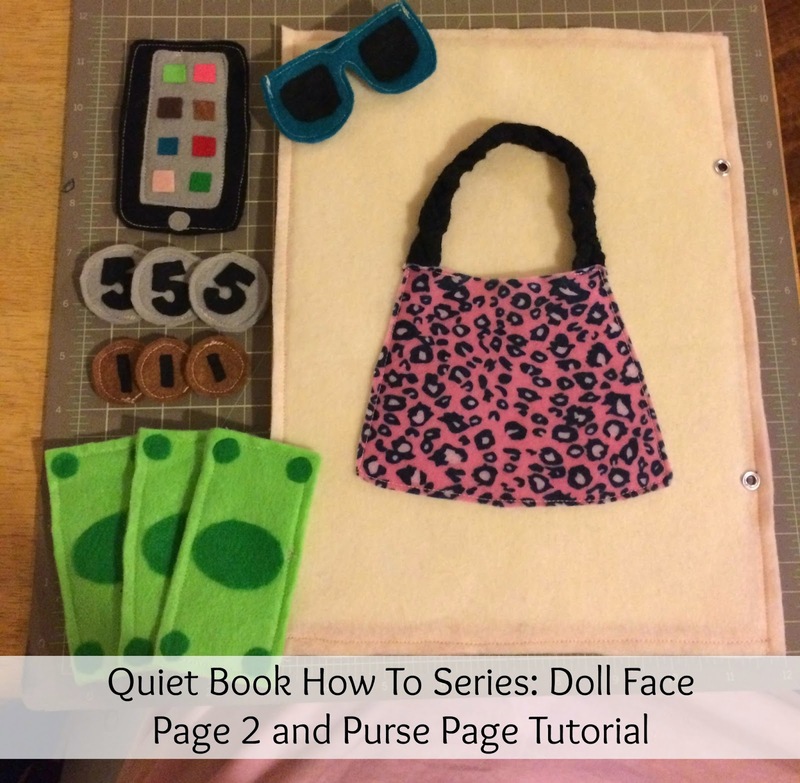 Place all of the Doll Face features you created in the previous page inside of the pocket. Print out the purse items template. Place a piece of fusible web on top and trace three of each of the number 1 and 5 on the coins. Trace the little square from the "iphone" eight times onto the fusible web. Trace three ovals and 12 circles from the dollar bill. Trace the inner screen of the "phone" onto a piece of paper and cut out. Cut out the coins, dollar bill, phone, and inner phone screen. Pin phone pattern to black and cut out two times. Pin inner phone screen to grey felt and cut out. Pin big coin onto grey fabric and cut out 6 times. Pin small coin to copper felt and cut out 6 times. Pin dollar bill to light green fabric and cut out 6 times. Draw a pair of sunglasses onto a piece of paper. Trace the inner lenses of the glasses onto fusible web. Cut out sunglasses pattern and pin to blue fabric and cut out two times. Iron oval and circles of dollar bill onto dark green fabric and cut out. Iron numbers of coin onto black fabric and cut out. Place 2 dollar bills together and sew all around with a 1/4" seam. Repeat for the other two dollar bills. Peel paper backing from oval and circles of dollar bill and iron on. Place 2 circles of the big coin together and sew all around. Peel paper backing from the "5" you cut out and iron on to coin. Repeat for the rest of the big and small coins. Place two pieces of phone together and sew all around. Place inner phone screen on top and sew all around. Iron on button and apps to the phone. Place 2 pieces of the sunglasses together and sew all around. Sew on the sunglasses sides. Iron on the lenses. Draw a purse shape onto a piece of paper and cut out. Pin on top of pink leopard felt and cut out. Cut out three pieces of black strips that are 10" x 1/2". Braid together to make handle. Sew handle onto purse. Place purse on top of cream felt and sew sides and bottom. Place all of the items inside the purse. Take the two completed pages and sandwich them together. The mirror page should be on top and the purse page behind. Stitch a 1/4" seam around 3 sides of the two pages of felt. Place grommets 3 inches down from top and bottom on the left side with the mirror page facing up. ** Stay tuned for my next tutorial where I will be making a colors flower page and back cover. OMG that sunglasses looks really cute! This is so clever and adorable! I can't wait until my daughter is old enough for this. Love this! So cute and I can't wait to make it for my daughter! That is a fun looking project. The sunglasses look really good. This is absolutely adorable! My daughter would love these handmade accessories for her dollies. I think I might make these for her dolls instead of the book. This seems easy to follow instructions and would make a really good decoration. What a cute project! I love handmade toys. What a wonderful idea! This is the cutest project I've seen in a while. OMG! Is This Adorable Or What Love It & Can't Wait To Make With The Girls! Super adorable I like what you did here, great work! I really need to invest in a sewing machine, this is too cute, my youngest daughter would love this, she is forever stealing my money for her purse..
That is super cute! I bet your daughter loves playing with this. My aunt has been making these and I was wondering how...now I think I know! You truly have the gift of creativity! I would love to be able to sew. My older sister, it seems, got all the crafty genes from my parents. You should feel blessed. This is adorable, I had to Pin it! Wish I was this creative. That looks like it takes a lot fo patience to make, but looks like you have goof sewing skills so it is probably quick. Those are so adorable-I really sometimes wish I wasn't a klutz and could make some of these things to give to my grand niece when she gets older! Great tutorial! Thank for sharing! I'm absolutely in love with your quiet book and I'm already looking if I can get the materials here to make something similar. I'll show you what I invented when I have something done :) although it might take quite a while. Oh wow! This is the cutest thing ever! Love the tutorial. Pictures are always definitely helpful! Awesome tutorial!I'll have to give it a try. I need to start sewing again!